Although I wish (desperately) that the gorgeous kitchen in these photos was mine, alas, it is not. 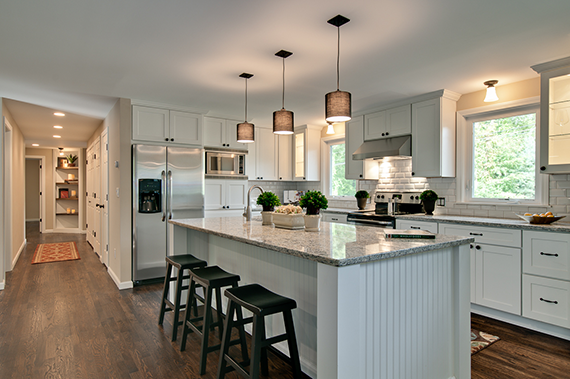 It was shared with me by my friends over at CliqStudios.com (they craft the most beautiful kitchen cabinets right here in the USA - and their prices are pretty great too), and features a remodel done by one of their trade pro customers (Simone Development, in Southington, CT). I decided to share it here too, because I absolutely adore everything about it, and want to be able to reference it in the future should I eventually decide to remodel my kitchen. The cabinetry, colors, appliances, and floor are all so inspiring to me. The remodeling process itself was also a great success, thanks to a few important tips (and avoiding some things as well) - all of which I'll be posting below. We haven't done any remodeling of entire rooms in our place, but we did a floor remodeling project last fall that some of you may remember. Our carpet was worn and buckled, and I was never a big fan of the linoleum tile in the kitchen, so we decided to replace it all with a laminate wood. We also decided to do it ourselves - and man did I learn some lessons along the way. Because we live in a townhouse and our downstairs is relatively small, we were certain that we could bust this project out in 24 hours. Wrong! So wrong. It ended up taking an entire week. Our biggest mistake was not planning out our timeline. Rather than writing down expected dates for each step (tearing up all of the old flooring, laying the new flooring, adding in all of the trim, and repainting the baseboards), we looked at it all as one lump project. We also didn't plan for the unexpected when putting together our budget, and the project ended up costing a little more than we'd anticipated as a result. 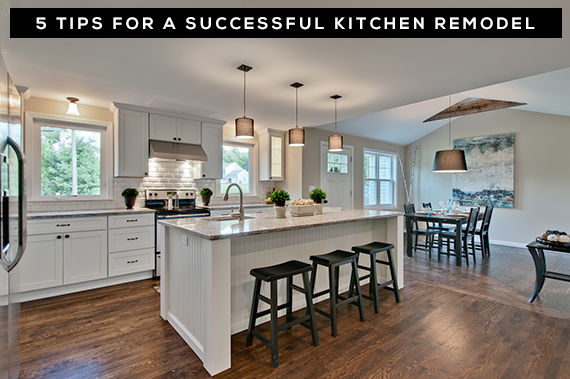 Have you done a kitchen remodel (or any remodel) recently? Do you have any other tips (or mistakes!) that you can share? This post was in collaboration with CliqStudios.com. Oh my goodness...look at all that space! I wish my kitchen was all open like that! One thing I would definitely do if we ever redid our kitchen is get the foil treatment on the cupboards. We did this in my studio and I LOVE it! I love white cabinets, but they can show dirt easily. The foil wipes off so easily and stays looking crisp and clean like white should. And you're so right about projects taking more time than you originally plan. My whole studio was this way! That's a great tip about the foil! One thing I'm glad I thought of was getting extra sockets - so useful with the appliances I sometimes need to use at the same time! We thought our flooring project would be super easy, too! Hahaha, how wrong we were. I did now that each step would pretty much count as a day, but what I didn't think about was how long it would take to actually cut all of the wood to go around door frames and the built-ins. Our kitchen "remodel" wasn't quite that extensive, but one thing I'd recommend is thinking about the lighting in your room. A lot of people overlook that until the end, when it's a lot easier to put it in your plans up front. That kitchen is soooo pretty and those tips are really useful thank you!! Avoiding the faulty measurement trap is such a great trip and one that I need to remember next time. That kitchen is also so stunning! These kitchen cabinets are beautiful! My dad was a cabinet maker and specialized in kitchens. He built the most beautiful cabinets and it makes me sad that he isn't here to make cabinets for my future kitchen. Luckily, I have some light fixtures that he made before he passed away that I will be incorporating into my future house. I did learn something from him though: choose a hard wood(like oak) because it will hold up a lot longer than other types of wood. I know cherry is pretty but its just not practical for a kitchen! 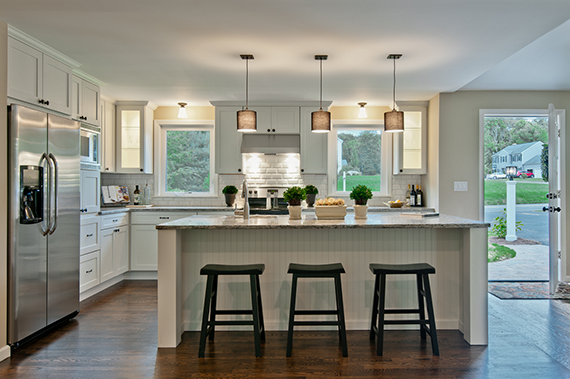 LOVE the light and airy feel of that kitchen -- and the gorgeous cupboards--and the island with seating!! When I win the lottery, I will know just who to call! This is the kind of kitchen that dreams are made of! Speaking of dreams, I would lvoe to redo my kitchen and my floors... but logistically, I'm not sure we're quite there yet. I'm not really very useful when it comes to home renovations and my husband can only do so much on his own. But one day. One day my kitchen, and floors, will look like this. This is one of our favorite kitchens so thanks to you Melissa for featuring it. 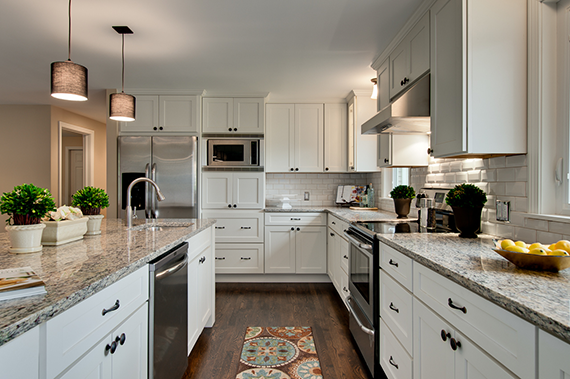 Our designer Kara Lepley partnered with our client Simone Development to make this kitchen come to life. 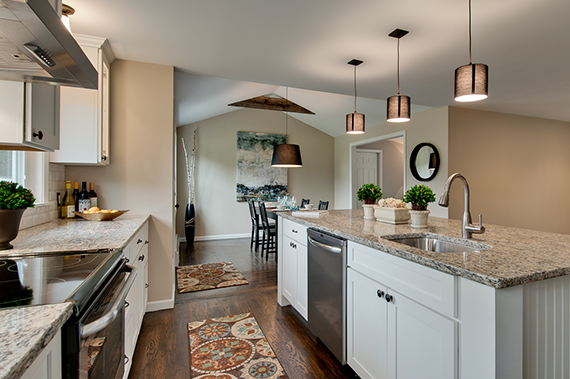 Kara's creativity and know-how was behind making sure the kitchen plan was both beautiful and functional. Great job Kara!